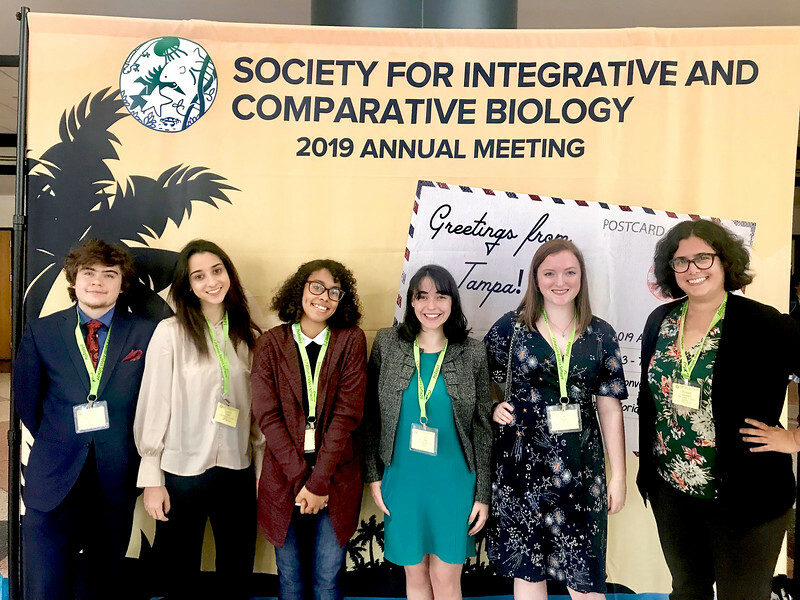 This January, eight biology students joined thousands of other researchers from across the country for the 2019 Society for Integrative and Comparative Biology annual meeting. The four-day educational and research forum was held in Tampa. Quinn Ferguson, Daphne Toglia, Jas Marie, Robyn McCartan and Kelly South with Assistant Professor Liz Leininger at the Society for Integrative and Comparative Biology. The students presented a poster on the neural and muscular basis of animal behavior. Sandra Domenech, Lauren Rodriguez and second-year Ben Lafond presented research they conducted last summer in Cayos Cochinos, Honduras, with biology and marine science professor Sandra Gilchrist. Lafond, along with first-year Marena Long, studied how populations of invertebrates change with the size of different species of sea anemones. Rodriguez, a second-year student who served as the teaching assistant for the students in Honduras, looked at interactions between hermit crabs and marine worms called sipunculids. The group presented a poster featuring each of their projects and how experiences of conducting research abroad is important to engaging and retaining undergraduate students. Lafond and Domenech said the experience helped them apply field techniques and learn about coral reef systems in more detail than they would inside the classroom. Another group of students that attended the conference presented two posters on research they conducted with professor of biology Elizabeth Leininger. Third-years Quinn Ferguson, Daphne Toglia, Robyn McCartan, second-year Jas Marie and fourth-year Kelly South have been studying the neural and muscular basis of animal behavior in Leininger’s neurobiology lab by observing a species called Xenopus muelleri, an African clawed frog. “As we learn about the physiology of more and more species, we get a better picture of how these physiological features have evolved,” said Leininger. Leininger said most of the students who presented at the conference were also instrumental in helping her set up her lab. Leininger’s students were able to attend the conference through funding from New College’s Council of Academic Affairs and Student Research and Travel Grant program. For most of them, it was their first scientific conference. “It underscores the fact that one has contributed to the body of scientific knowledge,” Ferguson said. — Shane Donglasan is the marketing writer/project coordinator at New College of Florida.